It is a special camera need to work with special marked cards, so we can also call it one to one infrared camera. It can be used to see all of the marked cards: poker contact lenses marked cards, normal infrared marked playing cards, and also the new far infrared marked cards. The marked cards only can be seen by special far infrared camera. The cards cannot be seen by poker contact lenses, marked cards sunglasses, and normal infrared camera. The special marked cards also cannot be seen by UV lamps, IR lamps and money detector. It can use 4G wireless signal transmission, you can see the image (marked cards) easily and directly all over the world, wherever and whenever. Besides, the signal cannot be detected by others. 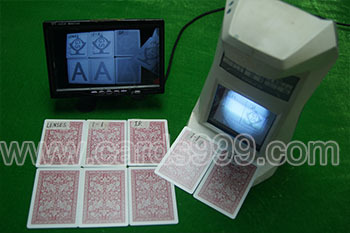 Infrared camera and infrared marked cards poker, many people are familiar with them. Some have heard of them, some have used them. Infrared is a light, its wavelength is shorter than radio waves, longer than visible light. It is well known that sun light can be divided into visible and invisible light. Through a prism, visible light will reflect the light of purple, blue, cyan, green, yellow, orange, red color (spectrum). Outside of the red light, 0.75-1000 micron wavelength in the spectrum of a period is called infrared light, also known as infrared. IR belongs to the category of electromagnetic waves, which is an electromagnetic wave that has a strong thermal effect. The wavelength range of infrared is very wide, different IR wavelength ranges can be divided into: near-infrared, mid-infrared and far-infrared region. The wavelength corresponding to the electromagnetic wave is called near-infrared, mid-infrared and far infrared rays. The most advanced and the most convenient type of marked cards is infrared marked cards and infrared camera. It's the most convenient to operate and it's accurate to recognize. Infrared camera is a kind of special marked cards reader. It can read the marked cards on the back. For many poker players, infrared marked cards are different from other kind of poker cheating device, luminous contact lenses marked cards ( back mark ) work with poker contact lenses and marked cards sunglasses, barcode marked cards ( side mark ) work with poker scanner system, the poker analyzer that can tell you the ranking. Infrared marked cards poker only can be seen by infrared camera lenses. It can use a long distance infrared camera to read whole deck of cards on the table. It is suitable for all poker games, Texas Holdem, Omaha 4, Omaha 5, Seka, Baccarat, Blackjack and so on. The infrared marked cards that known and used by many people, are near infrared marked cards. It is used widely in many countries, especially in Russia. Since many people know this kind of marked playing cards, it is not safe anymore. People know how to check the marked playing cards, they know that the mark can be detected by money detection machine. Do you want to owe a new poker device that can see all of the marked cards poker? Do you want to owe a new poker device that cannot be detected by anything else? Yes, your dream can come true, by Golden Sunshine Entertainment Products Co.,Ltd. We research and develop a new kind of camera, let us call it – Far infrared camera. It is a special camera need to use special marked cards, so we can also call it one to one (1-1) marked cards and one to one (1-1) camera. For our new camera, far infrared camera, it has a variety of functions. It can be used to see all of the marked cards, such as: poker lenses marked cards, normal infrared marked playing cards, and also the new far infrared marked cards. You just need to use our new one to one camera, and then can see all of the marked cards. For our new luminous marked cards, far infrared marked cards (one to one marked poker cards), it cannot be seen by poker contact lenses, marked cards sunglasses, and normal infrared camera. There is no denying that the other 2 kinds of marked cards, contact lenses marked cards, normal infrared camera marked cards can be detected by UV lamps, IR lamps and money detector. It is easy to check the mark. However, our new marked cards cannot be detected by UV lamps, IR lamps and also money detection machine. The magic marked cards only can be seen by our new far infrared camera. Far infrared camera and marked cards, is it amazing? There are some things, you need to strive to know the results, need to struggle to know our potential!!! If you are interested in them, please feel free to contact us.